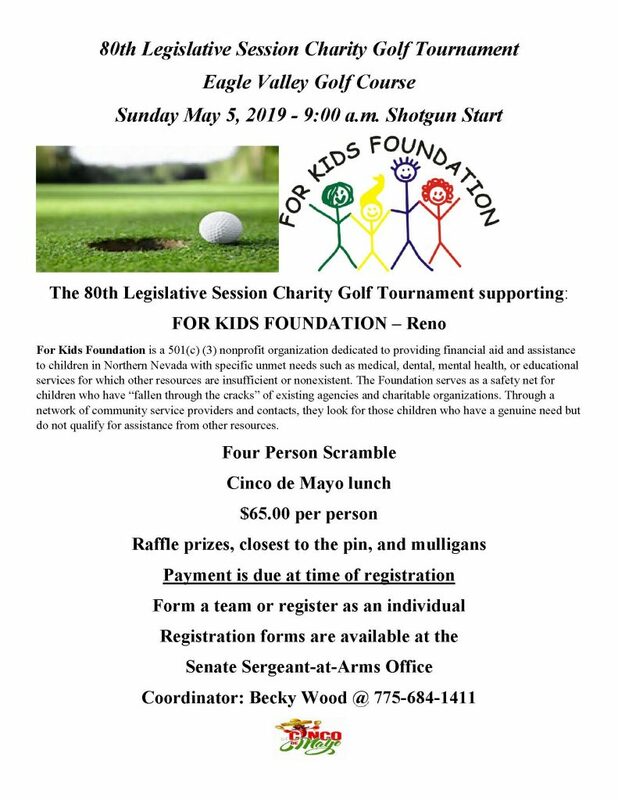 The 80th Legislative Session Charity Golf Tournament Will Be Supporting The For Kids Foundation – For Kids Foundation – A Charitable Organization that provides financial assistance to the children of Northern Nevada for medial services, educational needs, mental health and more. The 80th Legislative Session Charity Golf Tournament is being held on Sunday, May 5, 2019 at Eagle Valley Golf Course, Carson City. The funds raised through this event will be donated to the For Kids Foundation, Reno. For Kids Foundation is a 501(c) (3) nonprofit organization dedicated to providing financial aid and assistance to children in Northern Nevada with specific unmet needs such as medical, dental, mental health, or educational services for which other resources are insufficient or nonexistent. The Foundation serves as a safety net for children who have “fallen through the cracks” of existing agencies and charitable organizations. Through a network of community service providers and contacts, they look for those children who have a genuine need, but do not qualify for assistance from other resources. As coordinator of this event, I am seeking raffle prizes for the golf tournament. Please let me know if you would be willing to make a donation, such as a spa package, gift card, or similar donation. Individual hole sponsorships are also available for $100 per hole. The 80th Legislative Session Charity Golf Tournament tax ID number is 73-1642744.